The Cabaret ® Series is widely credited as being the first full line of portable PA systems for the musician and music store market. It established a market segment that has grown to be the largest of those addressed by JBL Professional's five product divisions. The inspiration and drive to see through their development, came from JBL's current Vice President of Marketing – Mark Gander. The following is his account of this series' history and market impact. The series began as result of a number of product requests which had been kicking around the JBL Engineering Department throughout the mid-1970s, and because of my personal particular interests in the product area and customer applications, I took it and championed it through development to fruition in production. Model 4602 – a 12" K120-8 with 2402 bullet floor monitor, the multi-faceted shape of which I conceived of and created. I presented a Feasibility Study for the line in July, 1978. Doug Warner of Warner Design Associates, former partner/understudy to Arnold Wolf, contributed design study renderings. Distinguishing elements included specially tooled stacking corners and optional, flush-fitting protective transport covers. I located 3M "Hedlock" mating fasteners for the covers, and also located spring-loaded cover caps for the 1/4" phone plug input jacks to prevent air leakage. I developed a special metal handle with the J. H. Sessions case hardware company with thick rubber on the movable bail that both improved handling strain and damped vibration noises. The enclosures were first manufactured of industry-standard cross-laminated Baltic or Finland birch. Later we developed our own special maple-faced poplar which had an even better strength-to-weight ratio. The product line was launched at the summer NAMM show in Chicago in June 1979. You can see me posing with the first three products, and a fourth that was the format for next additions to come, single 15" variants in the same rectangular enclosure as the 4622, outside next to the old engineering labs on the north side of the Northridge 8500 building. By the end of the year, the ferrite conversion of JBL cone transducers was taking place, and "A" versions of these systems were introduced using E-Series SFG (Symmetrical Field Geometry) models in place of the K-Series Alnico models. Later, as the ferrite conversion followed through on the compression drivers and ring radiator tweeters, those substitution upgrades were made and the Cabaret models became "B" versions. The next additions were a number of models in the same rectangular enclosure: the 4621 with a single E130-8 for lead guitar; an acoustic guitar and vocal system, the 4623, which added a 2402 bullet and high-pass network with L-pad level control to the 4621; and the 4625 with a single E140-8 for bass; and a two-way keyboard system, the 4627, with a E145-8 and the 2901A High-Frequency Power Pack, a 2410 compression driver on the 2301 perforated-plate horn-lens with a high-pass network. A double-size, rectangular 10 cubic-foot enclosure for a E155 18" for bass guitar was also introduced, the 4695. These were introduced along with a full line brochure at the January 1980 Anaheim, CA NAMM Winter Market show. When I moved from Engineering into the Pro Division Marketing department in 1980, I developed the introduction plan and marketing materials to promote the line, and defined the product additions that expanded its offerings. I was aware that there was a latent demand for better performing and more portable sound reinforcement systems, and that this product area had much greater potential than merely providing premium speaker cabinets for musical instrument amps. 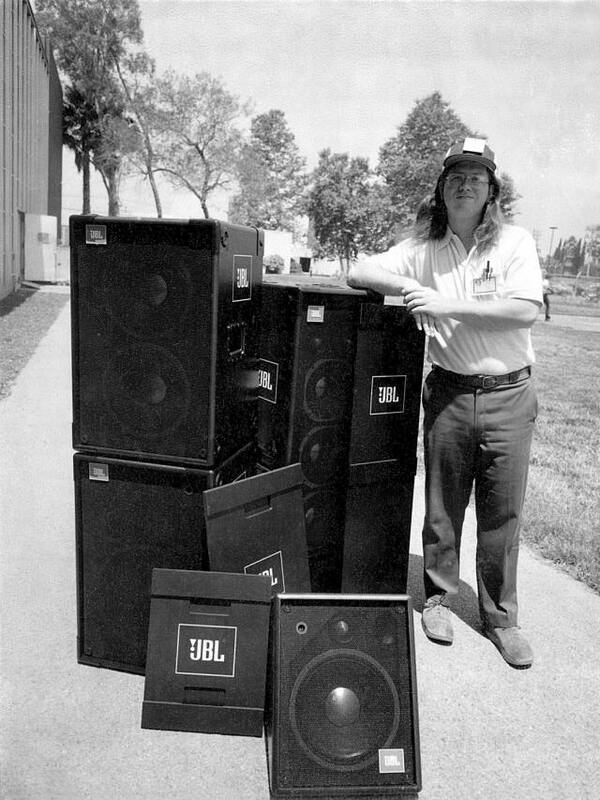 My first position in Marketing was that of Applications Engineer, and one of my first contributions was to generate a JBL Applications Note "Applications of JBL Cabaret Series as Modular Sound Systems." Influenced by the Grateful Dead's "Wall of Sound" modular system as well as other professional touring system packages of the 1970s, I showed how the building blocks provided by the various Cabaret Series elements could be configured into small PA and line array configurations as well as musical instrument systems, all of which could both be flexibly assembled as well as grow with the customer's needs. In June of 1980 the first real two-way PA speaker was released, the 4690, with an E140-8 and a 2410 compression driver on the only compact horn available at the time, a brushed aluminum version of the 2307 called a 2306. In addition to its place in the basic Cabaret line and brochure, a special brochure was developed to promote the 4690 together with the 4695 as a portable disco system. The success of the Cabaret Series and the burgeoning musician and portable sound reinforcement market in general meant there was demand for more compact high-quality system packages. In 1982, I conceived of a small configuration which would mimic the look of the large JBL 4350 and 4435 Studio Monitors and other similar systems, with two woofers side by side and a horn above. Don Keele's presence at JBL came into play, he having developed the 100-degree-by-100-degree-coverage Bi-Radial Horn concept for the 4430 and 4435 Bi-Radial Studio Monitors, and subsequently miniaturizing of the horn to mount on the ring-radiator motor and phasing plug assembly with 1/2-inch exit, first developed for the 2403 elliptical-mouth tweeter in the L220 hi-fi system. This new 2404 tweeter, in a "-1" version with the 2402 diaphragm in place of the 2405 diaphragm for lower crossover-point usage, coupled with two new 2118 8" drivers, became the 4612 Cabaret Series Mini-P.A. 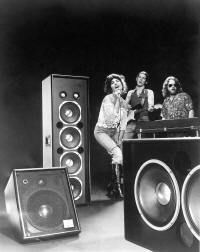 System, first introduced at the Atlanta Summer NAMM Show in June 1982. It was an incredible market success, combing visual appeal and high-fidelity performance at an attractive, affordable price point. A permanent installation version was developed in oak vinyl, including integral mounting points. David Smith, who also worked with Don Keele on the Bi-Radial Studio Monitors, was the system engineer on the 4612. With the availability of these parts, in 1983 the 4627 two-way Keyboard/Reinforcement system was upgraded and super seceded by a three-way model, the 4628, which used the 2404 and one of the 2118 8" as a midrange with the E145-8 woofer. Dean Rivera was the system engineer on this and other later Cabaret Series models. Don Keele had created the small versions of the large Bi-Radial® Constant Coverage horns with flat fronts at my suggestion to allow them greater utility in packaged systems, and the 4690 was super seceded later in 1983 with the 4691 which substituted the 2370 Flat-Front Bi-Radial horn. This constant directivity horn design, Constant Coverage as JBL called them, made the 4691 the most popular and most versatile of the Cabaret Series systems. In 1985 a floor monitor version was made, the 4604, slicing off the lower rear of the enclosure to create an appropriate angle for monitor use. As the packaged PA system success of the line broadened and was more fully recognized, more system variants were developed. Later in 1985 the big 4695 18" was transformed into two full-range systems: the 4698 Keyboard/Electronic Drum/Reinforcement System with an E110-8 10" midrange and a 2404H-1 tweeter, and the 4699 Full Range Playback/Reinforcement System with the same E110-8 as a midrange and the same high-frequency horn and driver from the now 4691B, the 2425J ferrite compression driver and 2370A ("A" here designating a re-tooled high-volume version) Flat-Front Bi-Radial Horn. 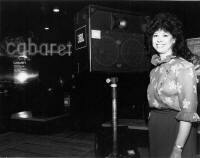 Optional casters were available to aid in the portability of these huge systems. 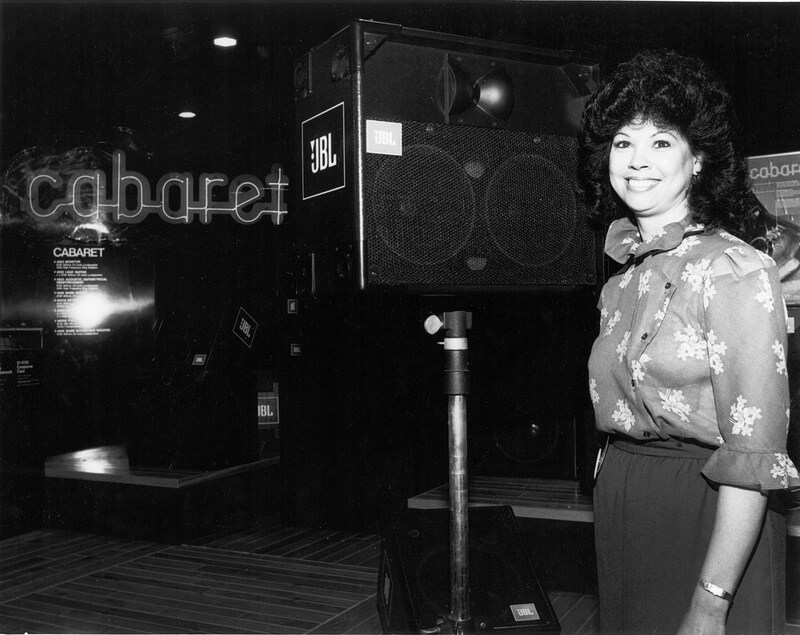 The Cabaret Series product line's success and longevity was exhibited by not only musician PA and musical instrument use, but many clubs, churches and other permanent installation applications choose the products in the 1980s developmental years of pro audio installed sound contracting. The line lasted until 1991 when it was ultimately replaced by the SR and MR Series, which had a more pro-audio and more portable appearance and performance, but it is still remembered fondly by many and some units can even be still found in service around the world. 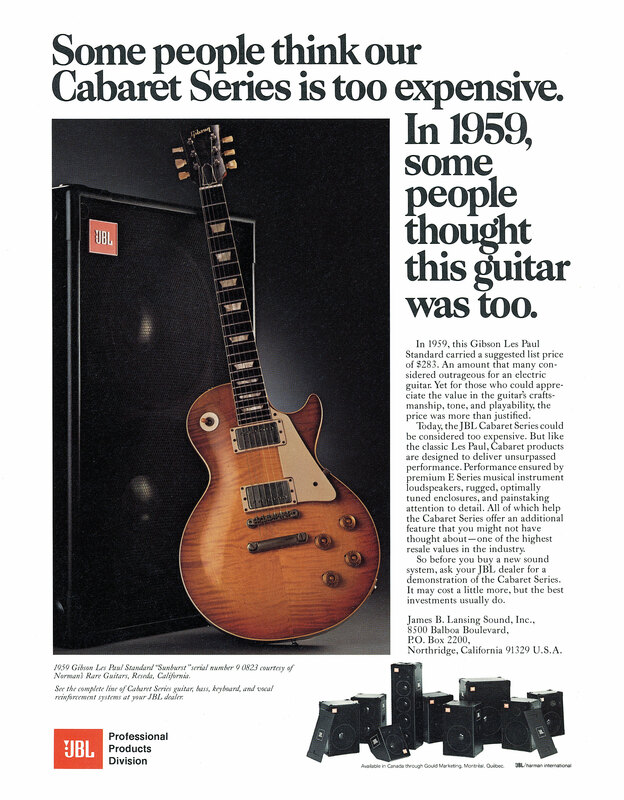 As a footnote, the name was revived for use on a special PA product line for the Sam Ash stores in the 1990s, and JBL still holds the registered trademark on Cabaret® for loudspeakers.